I have a dozen versions of this symphony on my shelves. 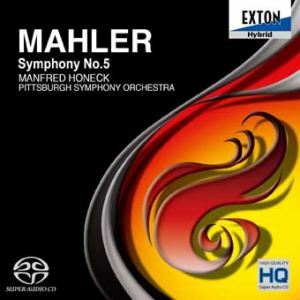 Not only is it one of the most extensively recorded of Mahler symphonies but it is also one of the most consistently successful. So how and why would I be able to recommend yet another recording? I certainly don’t need another and it would have to be something special to merit recommendation. That’s especially the case as this issue is undeniably expensive compared with bargain issues such as Frank Shipway’s stunning reading with the RPO on their Tring label or reissues of the celebrated versions by Abbado with the Chicago Symphony Orchestra or the accounts in the big bargain boxes offering the collected symphonies conducted by Tennstedt, Maazel or Levine. While their SACD sonics have generally been adjudged their strongest feature, the three previous issues in what is projected to be a complete series have met with a mixed reception regarding their artistic success. In them some hear a literalism or lack of poetry; others praise the “truthfulness” of Manfred Honeck’s interpretation. Most agree that the Pittsburgh Symphony Orchestra plays extraordinarily well, not least their Principal Trumpet George Vosburgh and Principal Horn William Caballero. Indeed those two soloists surpass themselves in this latest recording, even if their fellow string-players cannot emulate the sheen and glow of the greatest orchestras forming the competition. The Pittsburgh has had some financial difficulties of late but has acquired stability with the appointment of Austrian conductor Honeck in 2008 and the extension of his contract through to 2020. Honeck was a violinist for the Vienna Philharmonic playing under Bernstein and Pittsburgh predecessor Maazel. He generally favours a warm, Romantic, traditional sound and while he has a keen ear for balancing sonorities he is unafraid to give the brass their head. So, what of the specific merits or otherwise of this latest issue? I find it to be very fine but without anything especially striking to say. Direct comparisons with numerous competing versions leave me convinced that Honeck’s vision of this symphony is lacking somewhat in energy and attention to detail. Tennstedt’s phrasing, accenting and dynamics for example, are so much more varied and absorbing from bar to bar in the opening Trauermarsch. There is a lack of the necessary wildness and fierce concentration in both of the first two movements. Honeck’s trumpets do not shout, nor do the flutes scream “mit grösster Vehemenz” as they should and there is insufficient Schwung in his beat. This lack of passion is somewhat redeemed by the attack of Honeck’s Finale. Some have complained of the stridency of the brass here but I don’t mind their out-and-out assertiveness in a performance which sometimes borders on the good-mannered. The Adagietto, too, palls in comparison with the very best by such as Bernstein, Maazel and Tennstedt. All three had celebrated Mahler-specialist orchestras at their disposal: the Vienna Philharmonic in the case of the first two and the London Philharmonic, specially trained in Mahler by Tennstedt. By comparison with those two orchestras there is some want of richness in the Pittsburgh string tone. Nobody can make this music breathe like Bernstein while Tennstedt, too, in both his live and studio recordings, evinces his genius for long-breathed phrasing. Honeck tends to pull the tempo about rather aimlessly and loses the pulse in an account which is amongst the longest but not the tautest. The Scherzo conforms to the established pattern of first-rate playing without quite capturing the last degree of nuance in the music. In this case, the delicate ironic balance evokes what Willem Mengelberg called “forced joyfulness”. Yet all is beautifully played in first-rate sound. There is virtually no indication that this recording was made from live performances. I have to say that I listen to this disc on standard, rather than SACD equipment, although by all accounts this series has so far met with the approval of SACD enthusiasts. Ultimately, there are too many truly great recorded versions of this most popular of Mahler’s symphonies to justify my giving it a top billing, good as it is.